ABSTRACT—The most important image-stability information comes from natural aging. At Eastman Kodak Company we conduct long-term monitoring of photographic image changes at 24°C/40%RH, 26°C/60% RH, with a −23°C freezer check or control. Results for four products show good correlation between predictions from Arrhenius tests and trade experience. The stability of photographic images is of interest to manufacturers as well as private and commercial users of photographic films and papers. The most important image stability information comes from natural aging that most closely simulates actual use and storage. Information on light stability is useful, but dark stability is generally more important. All photographs experience the effects of dark-keeping, but many important processed images see little light exposure during their lifetimes. Most image-stability data on photographic products come from accelerated testing evaluating either light or dark stability. Early photographic standards, for example, have been based on rather severe conditions, such as 60°C/70% RH (ANSI 1984). Conditions of this type provide quick results on the relative dark stability of products. However, it is now generally recognized that such single accelerated tests at extreme temperatures and humidities have limited value since they do not always correlate to actual keeping during use. The advent of Arrhenius testing, in which a series of temperatures are used at a constant humidity to make extrapolations to room conditions, has provided us with a more powerful tool (Bard et al. 1980). This type of prediction is widely employed at Kodak for research and development as well as for defining the stability of new products entering the market place. For this paper it is useful to review the method for Arrhenius testing (Eastman Kodak Company 1988). At room conditions (approximately 24°C [75°F] and 40% RH), significant changes occur in color materials only after a long period of time. For this reason, it is difficult to obtain timely information on the stability of a product by evaluation at the actual keeping conditions. We can, however, predict the long-term density changes expected to occur in color materials by performing short-term tests at a series of high temperatures. In practice, samples of a given product are exposed and processed according to current recommendations to provide dye patches (see section 3) at densities of 1.0. These samples are stored in the dark at 40% RH for various lengths of time at temperatures ranging from 52°C to 93°C (126°F to 199°F). Samples are removed at appropriate time intervals to make density measurements. The method of predicting dark-keeping changes can be understood by examining the graph in figure 1. 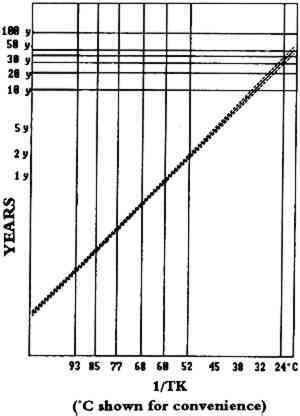 The relationship between keeping temperature and the time required to produce various degrees of fading is shown. The solid curved lines illustrate the blue density of the associated yellow dye at various temperatures during the Arrhenius test. 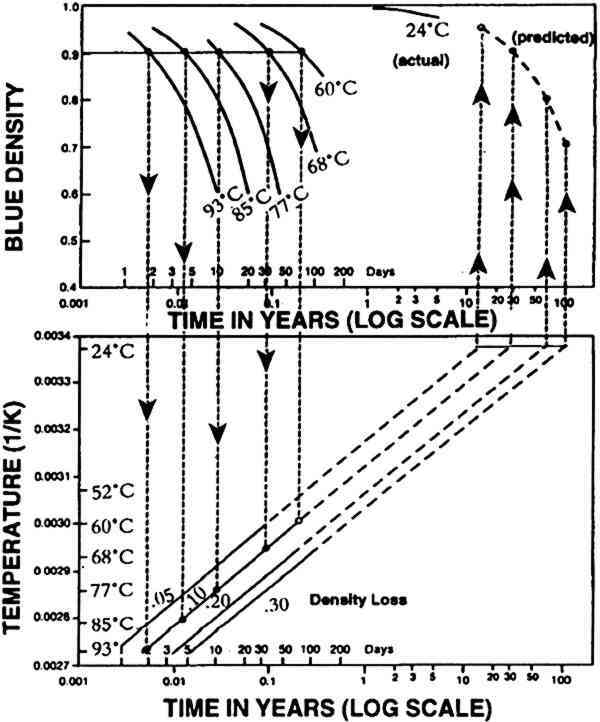 The time (log scale) to obtain a specific density change for each of the temperature curves is replotted against the reciprocal of the absolute temperature. Dotted lines with downward arrows illustrate the method for replotting the data from the 0.90 dye density level (a 0.10 dye density loss). 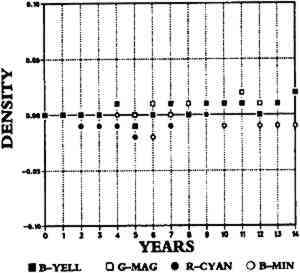 Similar replotting can be done from other density levels. After data points are derived from fading curves, they can be fitted with a straight, solid line. Theoretically, such straight lines can then be extended to predict the keeping time expected to produce a specific loss for any of the dyes. This prediction is made by extrapolation, which is shown by dashes. The intersection of these extended straight-line plots with the 24°C (75°F), or lower temperature lines, provides an estimate of the dark-keeping stability at that temperature. The times associated with specific dye losses are used to make a predicted dye-loss plot versus time at temperatures lower than those used in the actual test (see dotted lines with upward arrows, between the time temperature plots and the density plots). 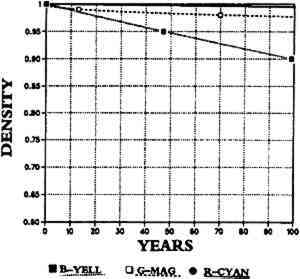 The curve shows a 0.3 blue density loss for the yellow dye after 100 years of storage at room temperature 24°C (75°F). Using the same methods, predictions for other density losses, dyes, and temperatures can be made. The full value of Arrhenius testing, however, cannot be determined at this time because we do not know how accurate the predictions are. 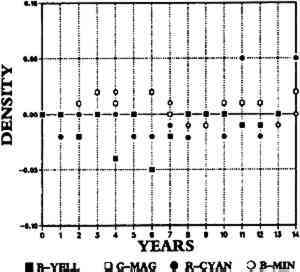 Figures 2 and 3 show Arrhenius data for KODAK VERICOLOR III Professional Film, type S. Figure 2 shows waterfall plots of the fading of the yellow dye across the series of temperatures shown at the bottom of the plots. The points appear to fall well on the lines, and the various temperatures show even spreads from one another and are smooth and similar in shape. In figure 3, the plots of the time for a 10% loss at the various temperatures form a well-behaved line with a 95%-confidence interval represented by the dotted lines, which are tight. We use a 10% change as an analytical tool only; losses would have to be larger for the photographic image to be considered unacceptable. Data like these (for the limiting dye of KODAK VERICOLOR Professional Film 6006) indicate that the Arrhenius model is working. Although there are scientific reasons to expect that our predictions are meaningful from such statistical and theoretical examination of many data, the only certain way to determine accuracy is by making direct comparisons with actual aging effects. Such comparisons are not easy to come by because of the scarcity of accurate measurements under moderate conditions for long periods of time. Furthermore, Arrhenius data are not available for older products, since the Arrhenius method has been applied to photographic products only in recent years. For the earliest products, we have data only from single accelerated tests. It is true that users have judged the stability of products by noting their behavior over many years of actual use, but almost always at conditions that were uncontrolled and often unknown. Fig. 3. Arrhenius prediction line for KODAK VERICOLOR III Professional Film, type S. Density yellow/40%RH. −.10 prediction is 34 years. Eastman Kodak Company has been conducting long-range or natural-aging tests for more than 20 years using carefully controlled conditions that simulate average use and storage. The Image Stability Technical Center, the repository for samples in this important study, contains a wide variety of film and paper products of various ages, both black-and-white and color. In this continuous study we monitor densitometry changes on products over time in controlled dark-keeping conditions. The conditions include a control at −23°C in addition to 24°C/40% RH and 26°C/60%RH. Fortunately, these conditions, which were selected many years ago for natural aging, are in good agreement with recent studies carried out to estimate actual conditions of use. In a Kodak study conducted in 1981 (Anderson and Larson 1987), we collected data on temperature and humidity continuously for the full year in two homes in Rochester, New York. The yearly averages were 50% RH and 21°C (70°F). Our test humidities (40% RH and 60% RH) bracket the 50% RH level, while the test temperatures (24°C and 26°C) are a few degrees higher than what we found in the homes. We do not know how these test conditions were chosen. However, it is fortunate that they appear to be more stringent than the average conditions found in homes, thereby ensuring that we will not miss any changes that might occur in actual use. The fluctuations in temperature and humidity are, however, not taken into account. More work is needed to determine if fluctuations are a factor. A special team, called Team Tortoise, conducts the natural-aging tests at Eastman Kodak. Essentially the same procedure has been employed since the initiation of our long-range testing program many years ago. Although some special tests look at such things as processing and enclosure effects, most tests are run on standard products. As new products evolve, tests are initiated using selected product. The chosen film or paper is exposed to test charts (fig. 4) and processed through the appropriate standard processing chemicals and conditions. A test chart is designed to produce patches of minimum densities (D-min) and neutral densities as well as cyan, magenta, and yellow patches to evaluate the individual image dyes. The chart includes a series of exposure steps that will bracket 1.0 density so that, after the densities of all steps are taken, they can be used in a mainframe computer to produce a smoothing curve across the range of densities and then to locate the exact 1.0 density, our point of reference for evaluation. After exposure, processing, and densitometry, the samples are packaged for keeping. The controls are sandwiched between polyester sheets, wrapped in aluminum foil, and sealed in a polyethylene lined bag made of aluminum foil at 40% RH. The packaging procedure for freezing also includes the use of a roller to remove air and an electric iron to heat seal the bag. Care is taken to place the sample in the freezer only after the sample is fully sealed. A frozen control sample is opened from conditioning for readings only after being equilibrated at room temperature for at least 3 hours. The 24°C/40% RH and 26°C/60% RH samples are packaged in individual envelopes (another type) lined with black paper to prevent irradiation from ambient light. The envelopes used have been analyzed and found to contain no harmful chemicals. Spectrophotometry, chromatography, and other methods were used to identify organic and inorganic compounds that might cause problems. The enclosures were found to be chemically inert in terms of oxidants, reductants, solvents, acids, or bases, sulfur, and other materials that might affect the photographic films and papers. The safely packaged samples are then placed in the appropriate keeping chambers for incubation. After a measured period of keeping, usually 1 or 2 years, all samples are retrieved from incubation, removed from packaging, and reread by status A or M (as appropriate) densitometry. Status A and M refer to filters used in the densitometer. Status M is used for negative films that are printed; status A is used for other products. We use optical density because it expresses how a photographic image absorbs light and is close to the manner in which the eye or a printer sees the differences. The formula used to calculate density is D = −logT where T is transmittance. We use a smoothing curve in the computer to calculate the exact changes at desired densities. The measured values are then compared to the original readings, and the differences at designated density levels are plotted against time. The levels of interest are generally B-min, 1.0 neutral, 1.0 cyan, 1.0 magenta, and 1.0 yellow. B-min refers to the D-min–(minimum density) patch read through a blue filter showing yellow staining in the highlights. Of most interest is the response of the D-min corrected values for the cyan, magenta, and yellow dyes. These generally show the first detectable changes and give us an early clue concerning the imaging dyes and the resulting overall stability of the product. D-min corrected image dyes can be explained as follows: Historically, color products have been analyzed for blue-light color separation (yellow dye), with the change in minimum density after incubation subtracted from the change in the patch. Thus, if the gross density change in the yellow patch is −0.20 density units and the change in the minimum density patch is +0.10, the net change in the yellow dye is calculated to be −0.30. Any changes in the red and green densities are treated in a similar fashion, although the largest changes usually occur in the blue density (yellowing). Data are plotted for each of the two roomlike conditions, 24°C/40% RH and 26°C/60% RH, as well as at −23°C (the control). When desired, we can also generate full sensitometric curves showing a comparison of the original curve to the resulting sensitometric curve at some point in the aging process. The control is used to give us some comparison since it provides an indication of the variability in measurement that is not product related in these long-term tests. This comparison is important since the length of time presents problems that are not present in the more common short-term testing. While variability in densitometry, handling, and keeping accumulates over a long period, mild conditions and repeated measurements aid in obtaining meaningful data. Crossover measurements are made when old densitometers are retired and new ones introduced. Samples are often run in replicate, and tests are combined in studying the results. The exact number of replicates is usually two but varies with the individual test. Within a test, the number of replicates per condition is the same. Over the years the number has varied from 1–5, depending on the designer, the material available, and so on. Many replicates are desirable, but the greatest advantage comes from pooling many tests. These types of data are pooled on a product-by-product basis to determine the actual aging properties of the images on photographic films and papers. As mentioned, these results are compared to our predictions from the Arrhenius method. Data on only four products will be presented due to limitations of space. We do not yet have data on our most current products now being sold in the trade because of the obvious lag in time required to collect the data. The four products reported on here are one black-and-white film, KODAK PANATOMIC-X, and three color products, KODACHROME Film, KODAK EKTACOLOR 37 RC Paper, and Kodak Dye Transfer Paper. These products were marketed for many years, and large quantities of processed product still exist in public and private collections today as photographic images. The color products have retained the same color dye sets for many years. In the case of KODACHROME and Dye Transfer Paper, we are using the same basic dye sets even today. The image compositions of some of our products have not significantly changed over time. For example, many of our black-and-white films form silver images that have some common features. Furthermore, some of our most long-term data are on black-and-white products. 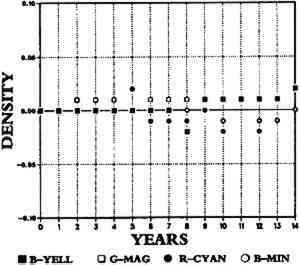 For example, figure 5 shows 19 years of keeping at 26°C/60% RH for KODAK PANATOMIC-X Film. The results demonstrate what is typical for properly processed black-and-white images of the silver halide variety through conventional wet processes (using fixing solutions). Such materials are known to be very stable, even archival under proper keeping. Fig. 5. KODAK PANATOMIC-X film. Long-term dark-keeping; 19 years. Freezer check-control. Superimposed curves, 26°C–60% RH vs. freezer check. For KODACHROME films we have been predicting, in many tests over the years (Eastman Kodak Company 1988), that it will take more than 100 years for a 10% change for any of the image dyes, neutrals, or D-min areas at 24°C/40% RH or 24°C/60% RH (fig. 6). Furthermore, we have examined old transparencies kept by their owners for several decades, and they still retain good color balance and density. With this knowledge, we were eager to compare the results of our natural aging (under known conditions) to our perceived impressions from general experience. 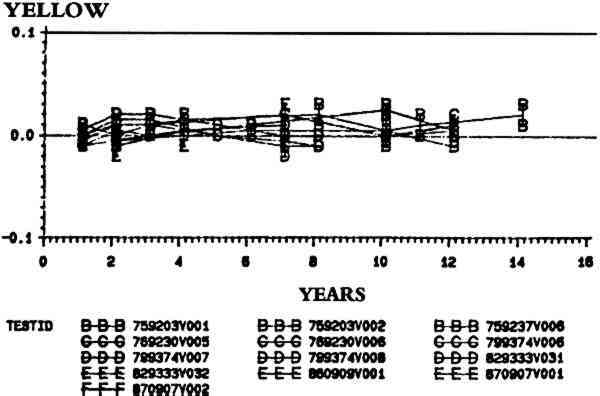 Figures 7–9 show the raw data for 13 separate emulsions that were tracked for up to 14 years of keeping. Plots are shown for B-min and for D-min corrected image dye (for the yellow) at a status A density of 1.0. An examination of the data will show only small fluctuations from zero and no significant trends. The raw data from the control show the magnitude of variability that is not image-stability related. A look at results for the other conditions shows similar behavior. The magnitude of fluctuation is not surprising, since the Image Stability Technical Center requires in excess of .04 density change before differences are taken as real in evaluating products. This requirement is based on years of experience and the known variability in densitometry and handling. The fact that the plots are flat (i.e., show no slopes) confirms the expected overall stability of KODACHROME Films. The results are further elucidated in figures 10–12, which show scatter plots of the average data for all the density changes and conditions. 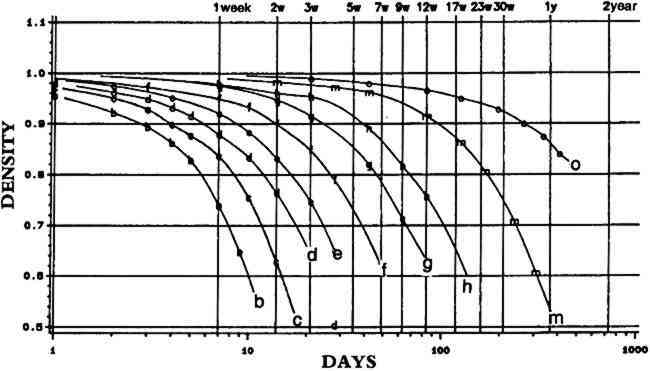 Natural aging confirms our predictions from Arrhenius tests and actual use: KODACHROME is very stable to dark-keeping. Fig. 10. KODACHROME Film. Freezer Keeping at -23°C, natural aging. Fig. 11. KODACHROME Film. Controlled keeping at 26°C /60%RH, natural aging. Fig. 12. KODACHROME Film. Controlled keeping at 24°C 40%RH. Natural aging. Another product that has had much use over the years is an older paper, KODAK EKTACOLOR 37 RC Paper. It contains the same dye set as its replacement, KODAK EKTACOLOR 74 Paper. Current papers such as KODAK EKTACOLOR Plus Paper are predicted to be several times more stable due to some fundamental changes in the composition of the cyan dye. Our Arrhenius testing on KODAK EKTACOLOR 37 RC Paper, as shown in table 1, predicts that cyan is the least stable image dye. 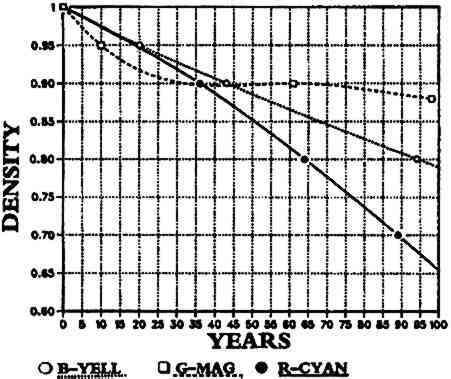 Based on 44 individual Arrhenius tests run over many years, it is predicted that it will take 8.49 (SD 2.24) years for a 10% loss of cyan dye at 24°C/40%RH. We have much less information at 60% RH since this Arrhenius method was implemented much later. At 24°C/60% RH we predict (based on only six tests) that it will take 8.50 (SD 0.55) years for 10% loss of the cyan dye. 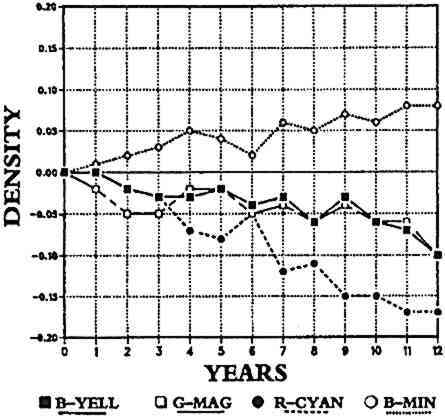 Our predictions are that the other dyes and D-min are much more stable, requiring several decades for a ± 0.10 change in status A reflection density. In the same manner as the data previously shown for KODACHROME, we have generated 12 plots for each of the three conditions and four density levels. The three conditions are −23°C, 24°C/40% RH, and 26°C/60% RH; the density levels are B-min, cyan, magenta, and yellow patched at 1.0. For lack of space we will not show these data. However, some clear trends are noted when we examine the line plots of the averages from the raw data (fig. 13). Specifically, we are averaging the data points at each time interval for all the jobs at each of the reference density levels. In particular one can clearly see a negative slope in the data for the cyan dye. This slope agrees with what we would predict based on the Arrhenius results just described. The prediction of only seven years for a 10% loss at 26°C/60% RH may be due, in large part, to the higher temperature. Also at 24°C, used for both Arrhenius predictions, there was no difference (humidity dependence) between 40% RH and 60% RH. Figure 14 shows our predictions for one of our present products, KODAK EKTACOLOR Plus Paper. It demonstrates the improved dark stability of the cyan dye (red density) as well as a rapid loss of magenta dye (green density) followed by a leveling off. 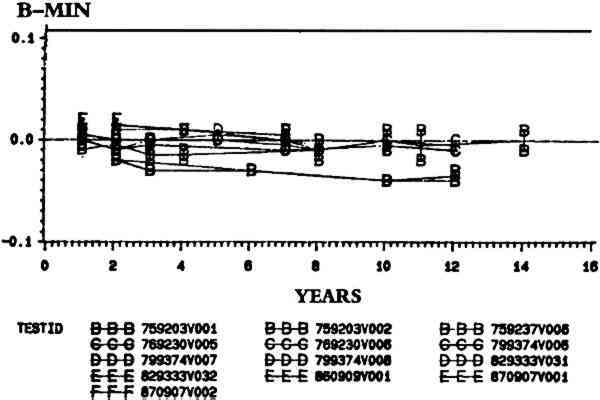 There is evidence of this same effect in natural aging, as seen in figure 13. Fig. 13. KODAK EKTACOLOR 37 RC Paper. Controlled keeping at 26°C /60%RH, natural aging. There also appears to be some evidence of blue density increases at both humidities, indicating that a stain is being formed. The gain in blue densities in the 24°C/40% RH samples (not shown) is not large enough to be significant. The amount of increase in the 26°C/60% RH data (fig. 13) is surprising since the Arrhenius tests (at 24°C/60%RH) do not predict such rapid increases at only 2°C lower in temperature. Despite these discrepancies, here again the overall results correlate quite well with our data from the Arrhenius predictions. As shown in figure 14, our modern papers in accelerated tests are predicted to last four or five times longer, but we do not yet have sufficient data from natural aging to verify the results. Fig. 14. KODAK EKTACOLOR Plus Paper. Predicted dark fading at 24°C/40%RH. The last product we will describe is KODAK Dye Transfer Paper, a product which has traditionally been known for its good dark stability. 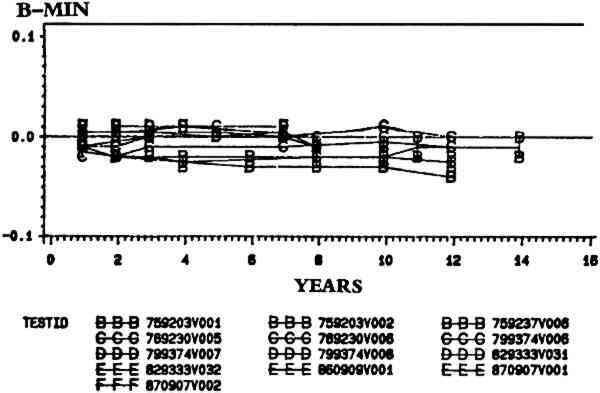 The natural aging verifies this reputation as shown in figure 15. Twelve plots of raw data have been generated, and these are summarized by showing only the scatter plots of the average values. 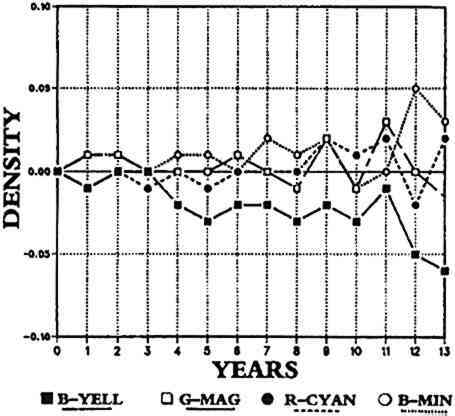 With the possible exception of some small losses in yellow dye at 26°C/60% RH, the natural aging shows no significant evidence of density changes. For years the Arrhenius predictions for Dye Transfer Paper have given predictions of more than 50 years for a 0.10 change in any of the dyes or minimum densities. Fig. 15. KODAK Dye Transfer Paper. Controlled keeping at 26°C 60%RH, natural aging. Although the general results seem consistent, it is interesting to note the high variability on the test data from this product. The reason for the variability is not known; it may be due to the nature of the dye sets, the thickness and lack of flatness of the paper support, or other variables that might affect densitometry but do not relate to the actual stability of the image, such as operator errors in positioning samples or physical defects such as spots, scratches, fingerprints, or dust. Kodak has been conducting natural-aging tests on photographic films and papers for about 20 years. A long-range testing program contains hundreds of jobs run (for the most part) on production materials through standard processes (the use of proper chemicals at specified conditions). A study of four examples (two films and two papers) shows good correlation with practical experience and Arrhenius testing. Even in the most severe condition—26°C/60% RH—the black-and-white film KODAK PANATOMIC-X shows no detectable changes after 19 years. Two of the color products—KODAK Dye Transfer Paper, and KODACHROME film—show no significant changes after more than a decade of keeping. KODAK EKTACOLOR 37 RC paper shows losses in cyan dye. 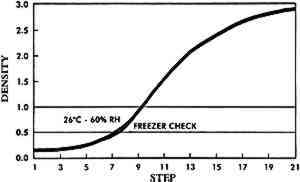 It takes approximately 12 years for a 10% loss at 24°C/40% RH, a conclusion that approximates the predictions at the same conditions from years of Arrhenius testing. KODAK EKTACOLOR Plus Paper is predicted to require 36 years for the same dye loss. These results are only an introduction to this important topic and the data associated with it. Although our natural aging data cannot be generally made available, a series of future papers about other photographic products are planned to report more of our findings. The authors wish to thank the other acting members of Team Tortoise—Deborah Chase, James Nolan, and Barbara Mule. This work represents the efforts of many people at Eastman Kodak Company, most of whom have long since retired. The results of their considerable foresight and efforts have yielded the valuable data which we have described in this paper. Adelstein, P. Z.1978. Preservation of microfilm. Journal of Micrographics11:333–37. ANSI. 1984. For Photography (film): Archival records, silver gelatin type on polyester base. ANSI/ASC PH 1.41-1984. New York: American National Standards Institute. Anderson, S. I., and G. W.Larson. 1987. A study for environmental conditions associated with customer keeping of photographic prints. Journal of Imaging Technology13(2):49–54. Bard, C. C., G. W.Larson, H.Hammond, and C.Packard. 1980. Predicting long-term dark storage dye characteristics of color photographic products from short-term tests. Journal of Imaging Technology6:42–45. Eastman Kodak Company. 1988. Image-stability data: Kodak KODACHROME films. Kodak Publication E-105. Rochester, N.Y.: Eastman Kodak Co.
STANTON ANDERSON is a senior research scientist in the Image Stability Technical Center of Eastman Kodak Company. He has worked for more than 20 years on the research and development of photographic products, processes, and their related image stability. He is actively involved in publishing, lecturing, and consulting on the conservation of photographic images. Address: Eastman Kodak Company, Image Stability Technical Center, 1700 Dewey Ave., Rochester, N.Y. 14650. ROBERT ELLISON, now retired from Kodak, is the former director of the Image Stability Technical Center. He held various technical and supervisory positions in the Quality Services Organization while at Kodak.